Line a shallow baking dish or flan pan with baking paper. In a food processer, pulse Barley+ Muesli Cranberry and Nuts until chopped roughly. Add coconut oil and nut butter to the muesli in the food processer and pulse again until the mixture is well combined and forms together. Make sure you do not over process. Using a spoon, take the mixture from the food processer and spread mixture onto the prepared dish or pan, forming an even flat circular pizza shape as you spread. Press the mixture down firmly with the back of a spoon. Place mixture in freezer for 30 minutes to set. Meanwhile, prepare fruit topping by peeling and slicing fruit into desired shapes. After 10 minutes, take out mixture from freezer and carefully remove pizza base from dish or pan onto a serving plate. Using the back of a spoon, spread yoghurt on top of the base evenly, leaving a few centimetres around the edges. 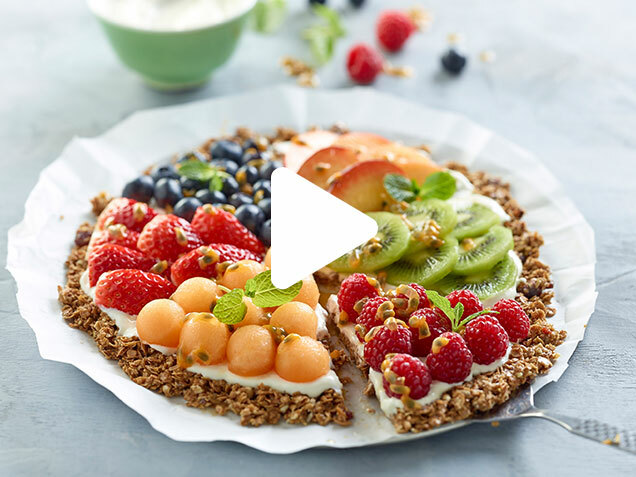 Decorate top of Barley+ pizza by arranging and pressing the prepared fruit into the yoghurt. Tear mint leaves on top over the fruit. Serve immediately or place back in the fridge until ready to serve.